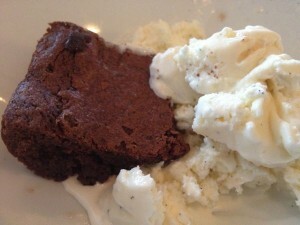 I think one of my most favorite things in the world to indulge on, would be a thick, rich chocolate brownie! Ahhh, served warm and with a dollop of fresh vanilla ice cream, gently melting and oozing down the sides of the gooey rich chocolate…. my mouth is watering right now as I would love enjoy a piece of pleasure eating one now! When I was younger and a baker (and a lot heavier) I used to make brownies and other sweets from scratch often. I got to thinking about a desert course for our December Beau Vigne Wine Dinner and decided I had to share these delicious treats with our guests! I used to follow a scratch recipe out of an old church cookbook that was a gift I received as a wedding gift nearly 30 years ago! since I hadn’t baked scratch brownies since I’ve moved from my last house over 14 years ago…. I opened that old cookbook and couldn’t remember which recipe it was! There were a number of different recipes to choose from and a number of pages were soiled from heavy use. I ended up guessing and tried one that turned out “fluffy” and with a “cake” texture, which is not what I was looking for. I then looked to see what I had on hand in the pantry and judging off a number of the recipes in the book created these based off of some of the ingredients. Second time was the charm! These were absolutely delicious and worthy of serving at our dinner! Start by melting the butter, shortening, cocoa powder and chocolate chips in a sauce pan over medium low heat. Combine sugars and mix into the melted ingredients. Slightly beat the eggs with the vanilla and add to the mixture. Mix in the flour and baking powder. Pour into a butter greased cake pan and bake at 350 degrees for 30 minutes. Allow to cool before cutting. We served these with homemade Vanilla Ice Cream (similar to this cinnamon recipe, omitting the cinnamon.) 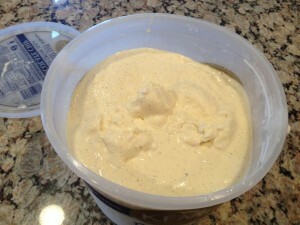 I made four batches and used an old ice cream bucket to store it until the event. 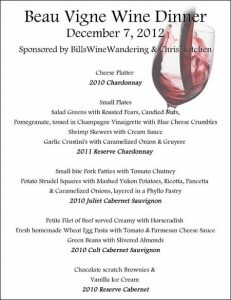 The desert course paired wonderfully with the 2010 Reserve Cabernet! Be sure and let me know how you enjoy them when you make them! !